The 2016 Budapest Degrowth Conference represents a unique opportunity to bring together hundreds of scholars, practitioners, local citizens and volunteers at a common meeting point in a manner which allows this critical mass of enthusiasts to leave a net positive benefit within the local community. 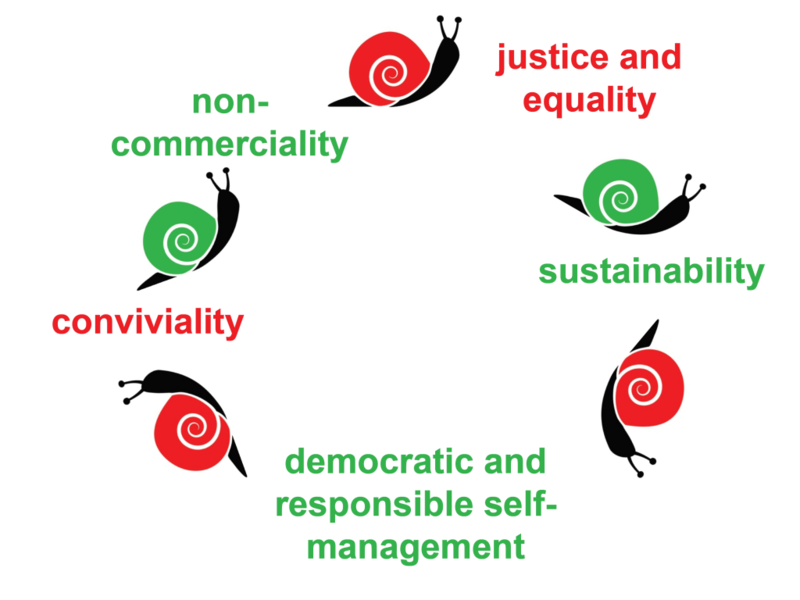 The organisation team has worked diligently to shape the conference program guided by Degrowth principles, while striving to ensure that proceedings represent a meaningful example of “Degrowth in Practice”. The planning and implementation of conference programs and activities will collectively represent an environmentally and socially conscious, convivial exchange of intellect, human capacity and respectful cooperation. Local resources Local resources, from food sourcing to initiatives, will be integrated into the preparation and implementation of the conference, along with an aim to support environmentally and socially conscious enterprises. Food and refreshments will be directly sourced from several local producers and will make use of developed partnerships with relevant civic groups who represent and share Degrowth values. Local experts, activists and practitioners are involved in the preparation and organisation of the conference, to a great extent on a voluntary basis. Conference as a stepping stone An important aspect is that the conference should not be considered a fleeting moment where guests gather for a week, only to depart individually and lose the collective spirit, but rather a building block towards further work and cooperation. This is why the Budapest conference will be organised in a manner that involves extensive contextual preparatory activities on the regional level, while at the same time allowing space for planning and discussing further joint activities among the participants. The conference is envisaged to be at least a regional, if not global, springboard for implementing degrowth activities at every level. Reciprocity economy A large part of the conference costs will be covered through reciprocity economy and voluntary in-kind donations. Priority will be given to creativity, recycling and sharing. The conference will also engage and support groups and alternatives that share degrowth ideals. Minimizing the use of resources The conference will work towards using the least amount of resources possible. Printing materials for the conference will be limited to the programme of the conference. We will not be distributing unnecessary conference gifts, flyers, or program materials. Participants will be asked to use only reusable cups and utensils, and food and drink providers will also be selected on the basis of ability to serve meals and refreshments without waste. A local waste reduction advocacy organization will provide technical support for organizing waste avoidance strategies which will be put into practice throughout the conference. Transport and access Budapest, due to its central location in Europe, is easy to reach by train or bus. It is also possible to arrive by bike or even on the Danube from Western and Eastern Europe. The Degrowth Conference organizers are encouraging all guests to travel to the conference in the most environmentally friendly way as possible, e.g. by train or group travel. Public transport within Budapest is efficient and there is an extensive network of bicycle lanes, along with a city bike sharing network. Conference participants will be able to utilize both. An in-conference bike sharing system will be proposed for the participants. To broadcast the conference to many different locations around the world without causing the need to travel, main parts of the conference will be streamed on the web and the local degrowth movements will be asked to organize local events in parallel with the conference. Deliveries inside the city will be made as much as possible with bike and cargo-bikes. Carpooling opportunities will be advertised in the transport section of the conference website to assist participants that cannot use public transport to reach Budapest in traveling in groups. Participants will be encouraged to compare the impact of flying and travelling by train to gain a better understanding of lower impact travel options: http://www.ecopassanger.org. Subcontractors and service providers For the process of conference preparation and for the conference itself we are selecting subcontractors and other service providers (e.g. catering) based on environmental and social merit. This means, among other things, that we are giving priority to local organizations, as well as organizations that operate an active environmental management system. Priority is given to partners and supporting organizations that pursue solidarity, ecological and emancipatory goals. Composition of the keynote and other speakers The composition of the plenary speakers line will be mindful of (apart from the geographical and gender balance) maintaining a balance between “notable and visible” speakers and local/regional experts and thinkers. Open access Particular attention will be given to intergenerational relationships and also to involve socially disadvantaged people (NGOs and civic organisations dealing with intergenerational relationships, homeless, and marginalized people). The conference attendance fee has been designed in a way which aims allow for people with different means to participate. Furthermore, we are offering funding for a limited number of participants who do not have the means to otherwise participate. To encourage active participation guests and to ensure that those who cannot afford to participate in the conference for various reasons can still do so in some way, the programme is designed so that even those who do not attend the conference in person (and thus do not pay the fee) can participate in events in the afternoon and listen to the evening keynote presentations and discussion. Gender equality The composition of the speakers will be mindful of gender balance. Also in the composition of the building blocks of the program (special sessions, self-organised free time) gender balance will be prioritized. In the organisation of the conference we distribute responsibilities conscious of gender-implications (male and female coordinators, spokespersons, etc.). We will strive for a gender-sensitive language in all our documents. Diversity The conference is striving to involve a wide range of actors as well as allowing for a diversity of program options. For example, different partners will be engaged each day in order to cooperate with multiple partners and to support different groups (donations going directly to the groups, based on the successful models established by community collectives and conscious food advocates working in local markets in Budapest. Food and accommodation options will provide for a wide range of needs (from accommodation in squats to engaging alternative social centers – ruin bars and civic cafes). We will offer vegan, organic, seasonal and regional food prepared by experienced kitchen staff and volunteers working in unison. To enable people with children to attend the conference we will attempt to provide childcare to the best possible level we can undertake, with the intent to maintain a family friendly environment. Openness and red lines The organisation committee of the conference rejects any kind of hate speech, discrimination, xenophobia or racism. The conference is organized based on the principle of open re-localisation, multilingualism, multiculturalism, tolerance and dialogue. North/South and East/West dialogue are at the heart of the conference. Also, efforts will be made to translate text and information into as many languages as possible, even if the central communication tool will be “international English”. Participative decision-making In the preparation of the conference decisions are being made by use of participative decision-making strategies. All organizers are invited to express their opinion and thoughts, and decisions are made together, on the basis of consensus. Self-organising The conference will allow for self-organised panel debates during the conference, whereby the participants will be able to invite particular speakers or respondents to take part in the panel debates on spontaneous topics. Rooms, scheduling and promotion will be provided by program and organisation teams. Participants will be invited to take part in the preparation and distribution of food and refreshments. Volunteerism While the conference will be assisted by numerous previously registered local and international volunteers, volunteer opportunities for conference attendees will also be communicated. A special need is expected for the preparation and distribution of meals taking place within the conference facilities. Non-violent communication Communication during the preparation of the conference – both within the organizing team and external – has followed the principle of non-violent communication. Non-violent communication will be practiced throughout the conference proceedings as well. Open communication has and will continue to be used to resolve any tension. Free access to knowledge All the plenaries and evening talks will be broadcast online (streaming coverage). An online social media platform will be used to distribute information. A degrowth bookshop with book presentations will be organised. The conference will be in English and Hungarian, to allow for local outreach. An archive will be established and maintained after the conference with all the materials of the conference. Regional participation in the organisation The organization structure is based on regional organisation. While past conferences mainly linked national organisers, the Budapest conference involves organisations from within the region, mainly Central and Eastern and South-East European areas. The organizers are maintaining constant communication with the international degrowth team and organizers of previous conferences. The conference requires visible speakers in order to attain good media coverage, recognition and raise interest, but this goal has been balanced with the wish to include regionally available knowledge and expertise as well. Balance between academic work, practice and free time The program of the conference reflects the principle of conviviality through aiming to find balance between academic, practical and free time activities, with much space for innovation and creativity. A balance between high level academic work and practical, convivial and/or artistic activities will be sought. This is also reflected in the program, where the academic presentations and sessions are scheduled for the morning and early afternoon, followed by more practical, artistic, communal and free time activities in the afternoon, finally closing with plenaries open to all. Balance concerning the size and scope of the conference On the one hand small is beautiful, on the other hand there is a growing interest in degrowth, which should be embraced by the conference. This is why the conference will be a mix of sessions that aim at reaching out and embracing the interest in degrowth (the afternoon and evening sessions that will be free of charge) and sessions that provide a place for focused focused discussion and knowledge exchange (the morning and early afternoon sessions). Non-profit basis The conference has not been organized with the intent to earn profit from its proceedings. Any surplus remaining will be used either to compensate conference volunteers, or to support non-commercial follow-up projects as well as the Degrowth Conference 2018. Non-commercial and low-resource solutions will be used wherever possible. Non-commerciality in funding The conference will not accept any financial contributions from profit-oriented companies or organizations that are associated with fossil-fuels, extractive industries, human or natural exploitation of any kind or capital-intensive production methods. Funding is only accepted if the funding institution is compliant with all principles outlined. Open source IT solutions are largely based on open source technology and with the support of IT collective ecobytes. The fonts used are open fonts. All the submitted abstracts, presentations or papers will be open and freely available (the participants will be made aware of this). Conference output will be published under the creative commons license. Budget The overall budget of the conference and week, without calculating neither the volunteer nor in-kind contributions, is around 120 000 euros. 80% is self-funded by Degrowth communities through participation fees. The rest is coming from different partner organisations. – Catering costs (lunches, coffee breaks, opening cocktail): 30 000 euros. – Travel and accommodation expenses (keynoters and volunteers): 20 000 euros. – Rental costs of facilities (rent of the university spaces), technical services (streaming, interpretation): 20 000 euros. – Degrowth Week activities (concerts,artistic perfomance, pracical workshop): 8 500 euros. – Communication, design, printings: 8 000 euros. – Implementation of open source IT platforms and tools: 5 000 euros. The rest of the money will be used to compensate organisers and support the 6th International Degrowth Conference. * Regrettably, we are unable to run the information and donation stall at the conference. However, if you wish to contribute towards the native fruit tree planting fund, please write to GreenDependent Association at info[@]greendependent.org and they will provide more details. Using this method, they regularly calculate and offset the carbon footprint of events, and document the fruit planting with pictures and a brief report. So, if you decide to contribute, you will be able to learn about what happens with your donation, and how many trees could be planted using it.